The last NHL game I played the "H. E. Double hockey sticks" out of was NHL 2002. After that EA took them all too seriously. Which is fine if you were after a simulation game, but 2002 was just fun to play. My none Ice Hockey friends enjoyed it. Even the commentators weren't taking it too seriously. Not that I stopped playing NHL games, I just enjoyed them a little less. I'd still rather dig out my xbox and play 2002 or '94 on the Mega Drive, for that matter. Another year, another NHL game with no rival. With no competitors to oppose them, EA have the monopoly and have little reason to improve much year on year. A good example of why a bit of competition can be a good thing. 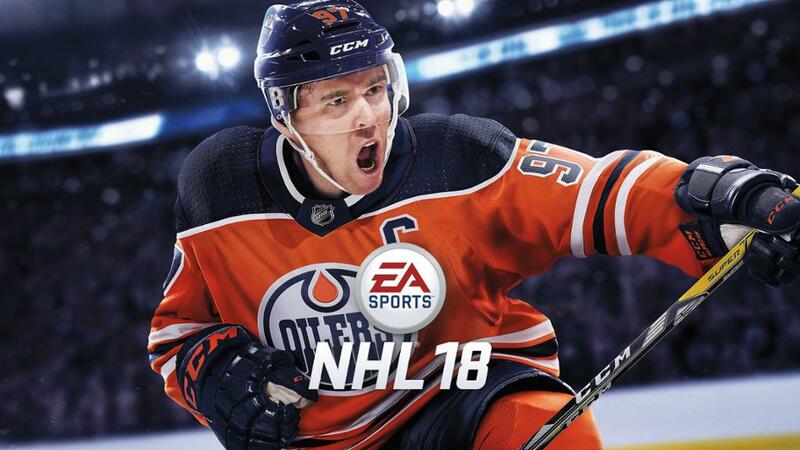 NHL 18 plays mostly the same as NHL 17. EA are reluctant to give up last generations Ignite Engine, which still plays and looks good enough but, as all of EA's other titles (Fifa, Madden) have moved on to the Frostbite Engine, I'd like to see NHL make a full step into current gen and do the same. Goal tenders are still using the same animations as last year. There have been a few tweaks to offensive and defensive play with more allowance over stick control, for dekes, advance single handed moves and blocks. Playing against someone who's mastered these can be a nightmare. The Pinned Menu is handy. Basically a customisable menu system, as there's about a million modes in the Main Menu, making it look really cluttered and daunting at first glance. This allows you to pin the game modes you're likely to play most to the front menu for easy access. Speaking of the million modes to play from, you get your standards. Online versus, so you can lose to a twelve year old Canadian kid and feel good about yourself. Season Mode and Playoff Mode, so you can be antisocial and not have to play with other people. For the first time, the NHL's 31st team, The Vegas Golden Knights are playable or you can make the 32nd team in Franchise Mode and create your own team drafts, design your own arena and your own mascot. You could make Emilio Estevez in Be A Pro (Mode) and make his dream of winning the Stanley Cup happen, as the Anaheim “Mighty” Ducks. Hockey Ultimate Team makes a return, so you can grind matches online, to earn points to use on booster packs, in hopes of get someone decent to add to your team... and then lose to that Canadian kid again because they've used their mums credit card to buy booster packs with real world money. There are a bunch of other modes, too, but NHL Threes is the best new addition to NHL 18. An arcade inspired interpretation of the new over time, three on three, rules. It’s the first to seven goals but each goal can be worth a different amount, set by the coin displayed. Being able to play as team mascots adds to the hilarity. If you want an up-to-date NHL game, you literally can't get a better one.... because you have no other options.